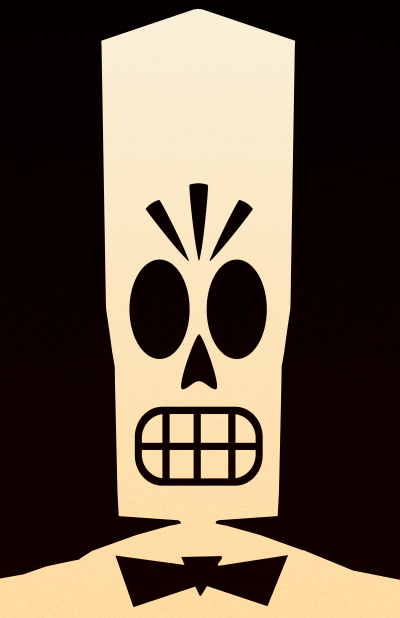 I certainly experienced mixed feelings when playing through Grim Fandango Remastered. Whilst it’s still an epic adventure that is equally adept at making one laugh as it as at jerking on your heartstrings, the high definition makeover feels distinctly lacking. This new version will allow a new generation to play through one of the greatest adventure games ever produced – with some much needed changes made to the control system and interface – but don’t expect to be blown away by the graphical upgrades. 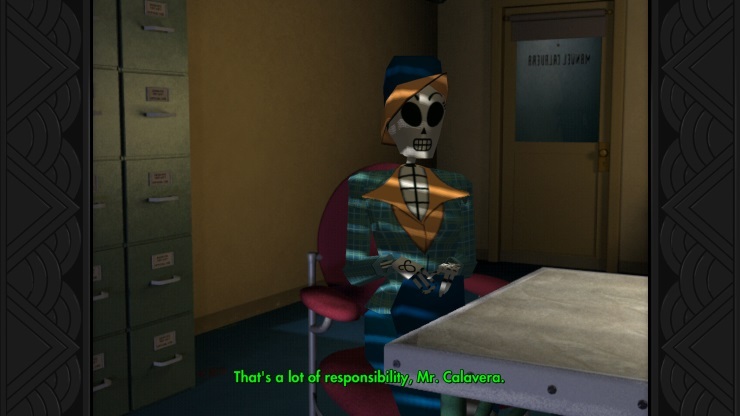 For those who haven’t had the pleasure of experiencing Grim Fandango before, it is a traditional point and click-style adventure with direct controls, that follows the story of Manuel Calavera – a travel agent who helps lost souls on their journey through the Ninth Underworld. The story spans four years and draws inspiration from Mexican culture and the Day of the Dead festival, mid-twentieth century Film Noir and Casablanca in particular, and Art Deco design. 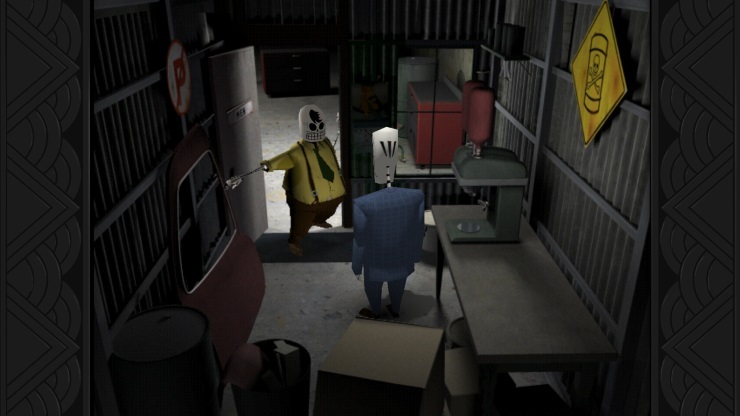 Pulling ideas from such a disparate range of influences could easily create a real mess, yet Grim fandango ties it all together into one strong vision of life after death, and tasks you with uncovering the corruption therein. To reveal too much about how the story develops would do a disservice to such a classic piece of story-telling, but suffice to say it delivers a fantastically gripping tale of star-crossed lovers and stars a great cast of both lovable heroes and vile villains. 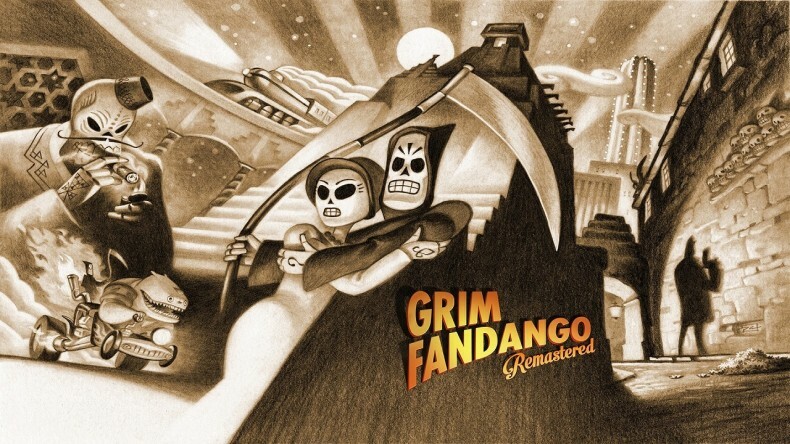 There always was an epic and cinematic feel to it all, and Tim Schafer and the Lucasarts designers were on top of their game with Grim Fandango – despite the technical limitations of it being their first graphic adventure that was produced with 3D character models and controls. Because of these reasons in particular, the title hadn’t aged well visually, and felt like a bit of a chore to control. Therefore it was with good reason that Double Fine decided to bring it a little more up to date in several respects. And this was certainly a success in some areas – the most impressive being the newly-recorded musical score. The music of Grim Fandango was always one of its best features. Catchy big-band beats are infused with Mexican folk guitar in a seamless manner, complementing both the action and setting throughout. Now it sounds better than ever, re-recorded by a full orchestra to great effect. The voice acting seemingly remains untouched, but is still top-notch even by today’s standards, with suitably authentic delivery all-around. New developer commentary tracks have been added too, so at highlighted points fans can play back the views of the original development team on different scenes and elements – a nice addition for longtime followers. The graphic overhaul, however, is somewhat of a mixed bag. All the character models and usable objects have had sharper and higher-resolution textures applied to them, with the result that they are all far sharper and clearer to look at, and previously muddy or pixelated details are now easy to discern. Completely new lighting effects have also been applied to character models in all scenes, adding a lot more Noir flavour and atmosphere – with window shutters cast upon worried faces and dark shadows obscuring evil-doers. This also eliminates the previously terrible shadows cast by the character models – no longer heavy blocks of solid colour, but now softer and much more natural. Cutscenes, too, have been re-compressed from source files, removing a lot of noise that was present in the original release. Having the option in-game to hot switch between the original and re-mastered graphics actually helps highlight just how little has been updated. Sure, the character models and lighting are infinitely better, but the background scenery barely changes at all, aside from maybe a minor resolution change. Although the scenes are still nicely designed, sadly they certainly appear to be lower quality when presented next to the sharp, updated character models. Things get worse still if you decide to switch to widescreen mode. It automatically loads into 4:3, with a suitable Art Deco border – however, the option for widescreen simply stretches everything, which obviously further effects the visual fidelity of the backgrounds, and isn’t true widescreen. These issues perhaps make the re-mastering effort appear a little lazy at times. The other main alteration in the re-master – the control scheme – is far more successful and very welcome. No longer are you forced to use Resident Evil style “tank” controls (though they are still available for purists), but now you can also make use of camera-relative keyboard controls, or direct point and click directions with the mouse. The variety of options should keep everyone happy, and they make traversing Grim Fandango’s fantastic world far less of a chore – especially during a couple of the more action-oriented sections, which are now more intuitive to play. None of these aesthetic issues effect the fact that Grim Fandango is still a very fun title to play. It is regularly truly funny, the puzzles are challenging but rarely irritating, and the storyline leaves you wanting to play more and to find out just what shady shenanigans are going on in the Land of the Dead. It is a difficult title to sell as you can’t easily define it, but it has earned its lofty reputation. 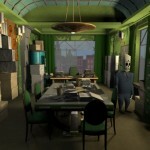 Grim Fandango is also a long game, and players will certainly get their money’s worth from this cut-price re-master. A selection of extra bonus features are great for Lucasarts aficionados and, as previously mentioned, the control method changes make it far more enjoyable to play through – whether it is your first or thirty-first time. While the remastered version might not nail every aspect one might hope for, It remains a must-play game. 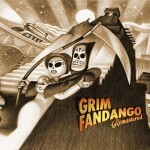 Grim Fandango didn’t manage to reach as many gamers as it deserved to on its initial release, and I hope more players can discover its many charms thanks to this new lease of life. 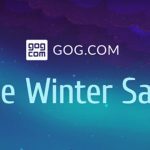 Although perhaps more could have been done, Double Fine have implemented a set of changes that make a truly classic title more palatable to the modern gamer.